Ocado, the worlds largest dedicated online grocery retailer, have partnered with CoreRFID to deliver an efficient method for their delivery vans to enter their distribution centre. 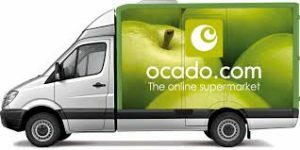 Ocado wanted a system where they could automate the in-and-out process of vans coming to their distribution centre. The main problem they were having is that drivers were spending too long waiting to get in, creating a bottle neck of vans. Ocado consulted CoreRFID on this, who came up with the solution of installing RFID Labels on the vans, supplemented with carefully positioned UHF Fixed Points Readers on the entrance point to the centre. Resources are able to be re-distribution into other areas of the business, saving costs. Driver are not delayed getting in the gates, improving time efficiency. Integrated easily into their existing back-end system. If you would be interested in finding out more about RFID technology then please contact us here.